Some 533 greyhounds still live at the shabby venue, which was Asia's only legal dog-racing track. The study, however, was unable to determine why higher muscle mass leads to a higher chance of breast cancer survival. On a sweltering afternoon in Macau, panting greyhounds lie in tiny concrete kennels at the gambling enclave's notorious dog-racing track, waiting to learn their fate after the venue closed. They are walked each day by an army of dedicated volunteers from all over Macau, who have been helping out at the deserted Canidrome Club since it shut down on July 21. Some 533 greyhounds still live at the shabby venue, which was Asia's only legal dog-racing track. [post_ads]Many of those remaining have patches of fur missing, a result of sleeping on wet concrete according to activists, who say injured dogs went untreated when the Canidrome was still operating. They believe up to 300 greyhounds were killed each year as they reached their racing shelf-life. First opened in 1931, the track's closure was a victory for those who had spent years criticising its treatment of the animals. But there is still a long way to go before the greyhounds can start a new life outside its walls. The firm which operated the track, Yat Yuen, failed to rehome the animals ahead of the shutdown, despite being given two years' notice by authorities. Macau's angry government has now stepped in to guarantee the dogs' safety. It slammed Yat Yuen as irresponsible and has threatened heavy fines for abandoning the greyhounds, a direct challenge to Angela Leong, fourth wife of Macau casino pioneer Stanley Ho and a legislative councillor in the city, who runs the company. Even then, the process of finding them new homes could still take as long as a year, said Anima board member Zoe Tang, given the medical treatments and paperwork required. "We hope we can assist in rehoming all the greyhounds -- we hope they will have a safe family forever," Tang told AFP. Yat Yuen did not respond to requests for comment. Yat Yuen organised adoption days in the weeks before the closure. But Tang says eight of the more than 100 dogs found homes through the firm's adoption drive are already back in Anima's care. One dog adopted out has died, she says. Campaigners are calling for a new, properly supervised adoption process. But some of the greyhounds at least have started a happier chapter. Macau pet shop owner Fei Chan, one of the volunteers at the Canidrome, adopted two of the dogs in the last few weeks. When she took in female greyhounds BoBo, 9, and Choi Choi, 8, they had skin conditions and some of their teeth had to be removed because they were rotten, she says. They are now recovering and roam gently around her store. "I thought: 'Why not let them live in our pet shop, and educate our customers about the good things we discovered in our greyhounds?'" Chan told AFP, adding, "In the end, I see no difference between greyhounds and other dogs. The ferocity of greyhounds only came from the training humans gave them. Why can't we teach them the other way around and tame them?" 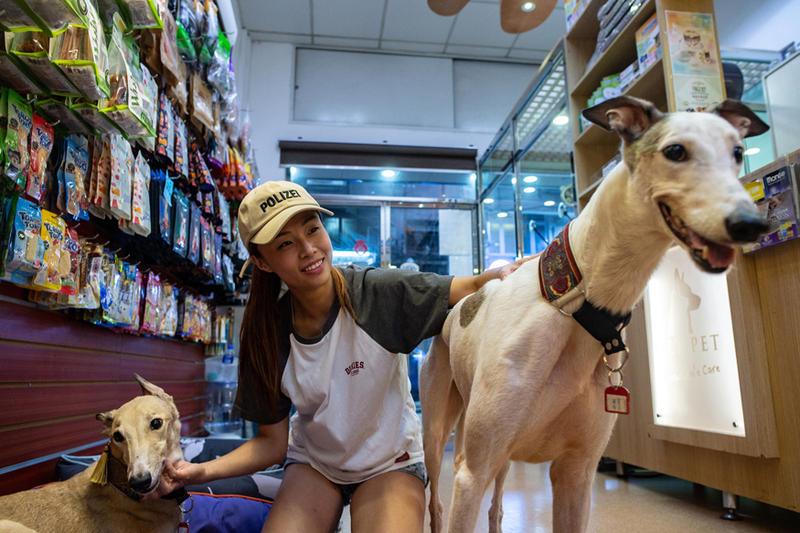 Another Canidrome volunteer, Georgina Lao, who is considering adopting a greyhound, dropped into the shop to spend time with the pair of dogs. She is still undecided on whether to take in a greyhound of her own because she is looking after a baby at home. But Lao says her volunteer work has opened her eyes to a gentler side of the dogs. "I found them very polite -- like well-trained soldiers," Lao told AFP. "Even when they want to dash out, as soon as you tell them to they will follow you back. They are very affectionate and very kind."